This publication describes proper methods of tree planting and advantages/disadvantages of different types of nursery stock. Common mistakes and misperceptions are discussed, as well as post-planting care. Trees are a beautiful and valuable investment. When they’re planted properly, many of them can live far beyond our human lifetimes, providing shade, beauty and other ecosystem services that far exceed the cost of establishment. If planted incorrectly, trees can become a liability or die prematurely, both of which are a wasted investment. Therefore, choose the right tree for the right place. The first consideration is to select high-quality planting stock. 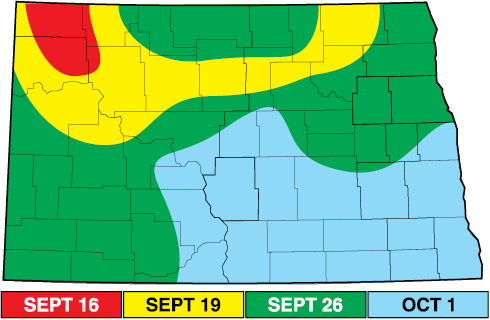 Trees must be hardy enough to survive our North Dakota climate, especially the long, cold winters (see Figure 1 for U.S. Department of Agriculture Hardiness Zones). A highly protected site such as a courtyard might allow planting less-hardy trees in certain situations, but be very cautious about doing this. Figure 1. 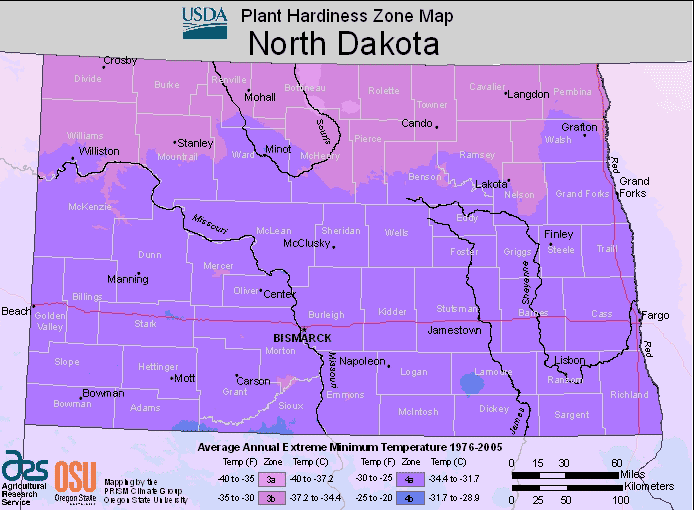 USDA Hardiness Zone map for North Dakota. Additionally, be aware of moisture needs of the tree and the characteristics of the site. Don’t plant conifers or lilacs in an area that occasionally floods. Nor should drought-sensitive species be planted on dry, sandy soils. Five nursery stock types usually are available: bare-root, balled and burlapped, potted stock, container-grown and trees that are transplanted with a tree spade. Understanding the differences among stock types will help you choose a tree that is best suited for your needs and your budget. Bare-root trees are sold without a soil ball. Instead, the soil is removed from the roots as the tree is harvested in the field. Generally, bare-root trees are sold for spring planting by online nurseries, soil conservation districts and, less commonly, retail nurseries. This is the least costly of the nursery stock types and the lightest to transport. Staking may not be needed if the tree is small enough. However, bare-root trees can be planted only when they are dormant in the spring. Planting later in the season decreases their survival rate. When purchasing bare-root trees, keep the roots hydrated by using moistened packing material (for example, shingle toe, sphagnum moss or hydrogels). While bare-root trees are economical, they are very sensitive to root desiccation. To maximize the survival rate, keep the roots moist and plant the trees promptly. Before planting, prune out any damaged roots or roots that may circle the stem. Balled and burlapped trees are grown in a field and then harvested with a sizable, intact soil ball. The soil ball is wrapped in burlap or similar material. Twine, plastic or a metal cage is used to secure the burlap. Balled and burlapped trees are generally larger than other nursery stock types because they usually are grown for four to six years before sale. Large shade trees and evergreens generally are sold in this manner, and this kind of stock is more expensive than other types. In contrast to bare-root trees, balled and burlapped trees can be planted anytime between spring and early fall. However, moving this kind of nursery stock is more difficult because of the large soil ball. Do not drop or attempt to shatter the soil ball because root damage may result. Another disadvantage is that a balled and burlapped tree suffers more transplant shock because the tree loses the vast majority of its roots when it is harvested from the field. Therefore, make sure to water the tree well during its establishment phase. Before planting, remove the twine, plastic or metal surrounding the root ball, as well as the burlap, even if these materials are labeled as biodegradable. If left in place, this material may cause problems with development of the root system. A potted (also known as containerized) tree is a bare-root tree that was planted in a container and grown for less than one season. While similar in appearance to a container-grown tree, potted trees may have a poorly developed root system. The root ball may not stay intact when the tree is extracted from the container. Therefore, take great care when planting potted trees. Container-grown trees are the most common form of nursery stock. Unlike potted trees, container-grown trees have been growing in a container for more than one growing season. As a result, the root system is intact and less likely to suffer transplant shock. A wide range of trees are sold in containers, and this nursery stock type has many advantages. They are lighter to transport than balled and burlapped and are more economically priced. Container-grown trees can be planted from spring until early fall and may survive better as fall transplants. However, container-grown plants are more susceptible to stem girdling roots (circling roots that eventually may compress the stem and its vascular system). Consequently, remove approximately 1 inch of the soil and roots from the outer edge of the root ball to prevent girdling roots. Large trees also can be transplanted with a tree spade to create an instant landscape. This is a great option if you need to move trees due to construction. While relatively large trees can be moved, the tree spade diameter should be at least 10 times the diameter of the trunk. The trunk diameter is measured with a caliper at a height of 6 inches above the ground if the diameter is less than 4 inches. Larger trees are measured at a height of 12 inches above the ground. The timing of the move is very important. The best times to transplant deciduous trees are early spring before the trees have leafed out or in the fall once the leaves have started to turn color. Evergreens such as spruces and pines also should be moved in early spring while dormant. Evergreens may experience severe transplant shock if moved while new growth is occurring. Late August through September is also a good time to transplant evergreens to allow the root systems to establish before soil temperatures drop significantly. Spring is usually the best time to transplant trees, although this general rule has several exceptions based on the type of nursery stock (see section on Nursery Stock Types). Bare-root trees can be planted only when they’re dormant, which really limits their use to early spring or late fall. Most species have better success with spring transplanting, although bur oak and hackberry seem to perform better as fall transplants. Ideally, fall transplanting should be completed while soil temperatures are still warm enough to allow for several weeks of root growth into the new soil (Figure 2). Planting beyond the recommended dates certainly may work, but the chance of success decreases later in the year. Figure 2. Ideal fall planting dates. Regardless of planting season, you must take care to keep the soil ball together and the fine roots moist. A number of utility lines, including electric, phone, gas and cable, may be buried on your property. Contact North Dakota One Call at (800) 795-0555, 811 or www.ndonecall.com/. Utilities should be located before planting a tree or even building a fence. In fact, locating utilities before excavation is the law, so be sure to complete this step before planting. For tree transplanting, the hole doesn’t need to be very deep. The hole depth should allow the “root collar” (also known as root flare or stem flare) to be at ground line or slightly higher (Figure 3). The hole should be about twice as wide as the root ball, although bare-root trees may not need a hole this large. Figure 3. Proper planting depth. If the soil is heavy clay, rough up the sides of the hole to prevent glazing. Use caution to avoid drastic soil texture changes, such as transplanting a tree from a sandy soil to a heavy clay, because this may cause problems such as extreme waterlogging. Before planting, remove the pot or any wire basket from the root ball. Unless wire baskets are removed at planting time, they can cause major structural problems later, resulting in premature removal of the tree. All twine and burlap should be removed as well because they do not break down in the soil as we might expect. Remember: No matter the type of planting stock, keep the roots moist during transplanting. If the roots dry out, then the tree will die. Place the tree in the hole at the proper depth. This may involve removing soil from the top of the root ball if it was planted too deeply earlier in its development (more common in balled and burlapped and containerized planting stock). You might need to add soil in the bottom of the hole to ensure that the tree is not planted too deeply. 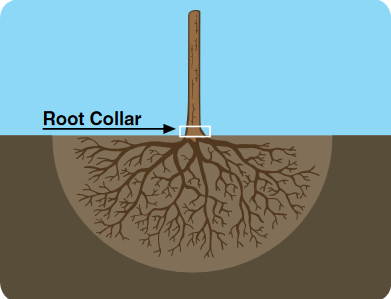 Remove any circling roots on the edge of the root ball (Figure 4); these are more common in potted or container-grown trees. Removing these may require extreme measures, such as removing the outer inch of soil (and roots) from the root ball. If circling roots remain on the root ball, the tree likely will have structural problems in the future and will need to be removed long before it reaches maturity. Figure 4. Remove circling or potentially girdling roots before planting. Backfill the hole with the original soil that was removed. Break the soil into smaller clumps if possible. This will allow the roots to extend into the new soil more easily. While fertilizer certainly will help the tree to grow more quickly, the soil usually already has enough nutrients to provide for the tree’s needs. Other soil amendments do not provide any benefit to the tree and are not needed. Some type of mechanical support might be needed, especially for larger trees. This usually is provided by two or three straps, attached by wire to stakes placed outside of the planting hole (Figure 5). Straps should be placed no more than one-third of the distance up the stem. Figure 5. Staking and strapping used to provide extra support to newly transplanted trees. The system should allow some limited movement of the stem while keeping it straight. Do not place wire directly against the tree’s stem. When done correctly, the stakes should be used for one year, or two at the most. If the tree requires staking for a longer time, it may need to be dug out and replanted. The tree should be watered immediately after backfilling and staking. This will help remove air pockets from the soil and improve root-to-soil contact. Future watering will depend on rainfall amounts or lawn irrigation. Waterlogged soils are a common problem that occurs when lawns are irrigated daily or more often. If the soil is moist, the tree does not need additional water. If no additional water has been added through rainfall or lawn irrigation, water twice a week during the first month after transplanting, once a week during the second month, and then cut back to once every 10 to 14 days. Organic mulches such as shredded bark or wood chips can help minimize competition from weeds or grass, retain soil moisture and ameliorate extreme soil temperatures. Place 3 to 4 inches of mulch around the tree to at least the distance of the root ball; keep a small ring next to the stem free of mulch. Check the soil moisture once a week and water if necessary. Do not prune the tree at planting time unless a specific branch is diseased or broken. Some type of tree wrap may be useful to protect the stem from pests such as rabbits or deer, as well as from sunscald injury in the winter. Many tree wrap products, including hardware cloth, corrugated white plastic pipe and paper wraps, are available. Remove the tree wrapping material each spring to prevent insect infestation or disease, which can result from moisture buildup under the wrapping material. Tree wrap should be used for two to three winter seasons, depending on tree species.